Traction is one of those words that gets flown around insurance brokers offices such as AQuote Insurance, but the principles of traction and its effects are not as well understood as you might expect. Without good traction you can have as much power as you please but you won’t be able to apply any of it to the road or turn it into acceleration. Understanding traction will help you ride better and to corner better, so here’s our definitive guide to the principles of traction. Traction is about friction, normally thought to be a bad thing but actually this friction force is what creates grip between your tyres and the road, keeping you upright. This force acts tangentially to your tyres (i.e. at right angles to the road surface) but this varies depending on the lean of your bike. 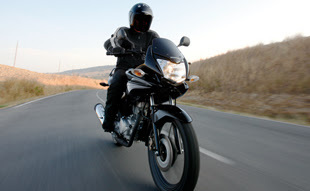 Your traction has a finite limit and if your bike demands more than this in, say, a heavy braking incident or a slippery corner, you may give way and end up slipping. On the start line or at the lights, you will only be using traction for one thing: going forward. The drive from your rear wheel acts against the road and this force, as you’ll remember from your secondary school physics lessons, must create an opposite force! As a result, you end up going forward. The reverse is, literally, true when you’re braking. Brakes act as a reaction to your forward power and, in turn, use up a bit of your traction limit. Turning is the final demand on traction and you must imagine, for example, pushing a boat forwards and left at the same time. It all uses up your effort. Race riders know and use their traction limits to their advantage. Spreading your traction uses (braking, turning and accelerating) efficiently can help you get through corners not only faster but much safer. The difficulty is that this changes depending on the conditions. A new set of tyres, a rainy day or even a scorching hot Spanish autovia will all perform differently. Racers spend a lot of time working with traction limits as racetracks and sports bikes usually perform consistently. With the sort of data available to MotoGP riders it’s possible to make a split-second decision on a corner. For the rest of us, however, the most important thing is staying upright and cornering well within the limits of our tyres. There’s a difference between understanding and properly using your traction and the only way to really get to grips with it is practice. Remember that your bike will perform very differently in different conditions so don’t assume you can take a wet corner at the same speed as a dry corner; it won’t happen!